No Pets Allowed. That was the policy in the Santa Monica apartment building where Liora and David Krasnow lived. They were hoping to one day move to a pet-friendly place, but so far, Liora had to restrict herself to looking at Petfinder and just dreaming about one day having a dog. Read Mochi’s story in Liora’s words. 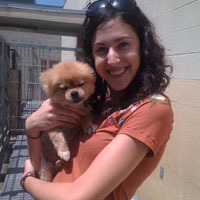 She had always loved Pomeranians, so that’s the breed she began looking at on Petfinder. It wasn’t long before she fell in love with one cute little teddy-bear-faced Pom listed by West Valley Animal Shelter in Los Angeles. She asked what was going on, and David revealed that he had convinced their building manager to let them have a dog. They went to two shelters before going to West Valley Animal Shelter, where they began looking for the Pom she’d seen on Petfinder. She was nowhere to be found. Finally they asked about her. “Oh,” a staff member said, “She’s on the truck to go to Petco for a pet adoption.” Liora’s heart sank, and then it lifted again when the woman suggested maybe the truck hadn’t left yet. Sure enough, when they went to the parking lot, there it was. The staffer fetched the little Pom, and the pooch covered her “mom-to-be” with kisses. As it turned out, Mochi didn’t seem to be house trained. But the couple soon learned it was a result of diabetes. Today, two insulin doses a day keep her symptoms in check. Her special need doesn’t bother the Krasnows, who just feel great joy at having her in their lives. Adopting her together was a great way to celebrate their anniversary.